I haven’t blogged for some months. I’ve been really busy and at a bit at a loss for something new and interesting to blog about. The health system in SA has faced so much gloom-and-doom of late. But a few weeks ago a research article I collaborated on with colleagues got some really good airtime in the media (here and here) and on radio, and today I’ve has the opportunity to sit down and write a post. These articles read well with my PhD work as they reinforce the notion that improving organ transplant in South Africa is not just a macro-endeavour of persuading the government to legislate it more robustly or to undertake public education. It is also a micro-task, where we have to address the actual perceptions and attitudes of people on the ground, in our hospitals. These individuals, through their actions, have the power to shape transplant practice on a daily basis. Nurses are an integral part of this group. It’s nurses – not doctors – who spend the majority of time with patients and their families. It’s nurses who have the conversations and interactions. In this sense, nurses are immensely powerful. They have the opportunity to shape opinions and preferences ‘at the bedside’. 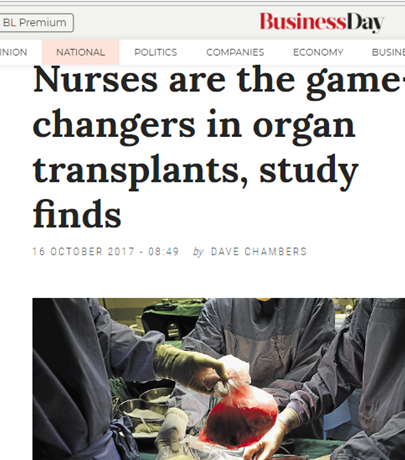 But the research study we contributed to clearly showed that nurses are not always willing to refer deceased organ donors, and they don’t feel sufficiently empowered to broach the subject with families. This lack of professional autonomy may be explained by the distinctly hierarchical environment in which nurses work. One false move can result in censure from a doctor or manager, who is ‘higher up the food chain’ of the hospital structure. I get the sense that in order to avoid these types of unpleasant interactions, nurses may be unwilling to take initiative – and who can blame them? None of us want to be chastised in our work environments. The reason this has become a problem in transplant is that there is a distinct lack of protocols to guide nurses in the recommended course of action for referring a deceased organ donor. So the sense of insecurity, propagated by the hospital hierarchy, is not mitigated in any way when it comes to organ donor referral. A protocol might add this element of structure, and make nurses feel safer in this environment. But some don’t favour protocols. A colleague recently remarked to me: “But what’s the point of having a protocol, we just slap it up on the wall and no-one ever reads it”. I think this does protocols an injustice. When they are properly implemented, with training for (and input from) the entire team, protocols have been helpful. But this implementation requires an investment of time and energy – and maybe with the huge rate of staff burnout in hospitals the will is simply not there. What is clear is that nurses practicing in Johannesburg would feel more comfortable referring organ donors within the confines of a formal protocol. Perhaps it is time to consider putting such a protocol in place, as we need to take a much more proactive approach to overcoming clinical barriers to transplant if we wish to increase our donor numbers.